Je suis Charlie. Je suis juif. I am Charlie. I am Jewish. People hold up signs that say, Je suis Charlie. Will they hold up signs that say, Je suis juif? Je suis Charlie. Je suis juif. I am Charlie. I am Jewish. 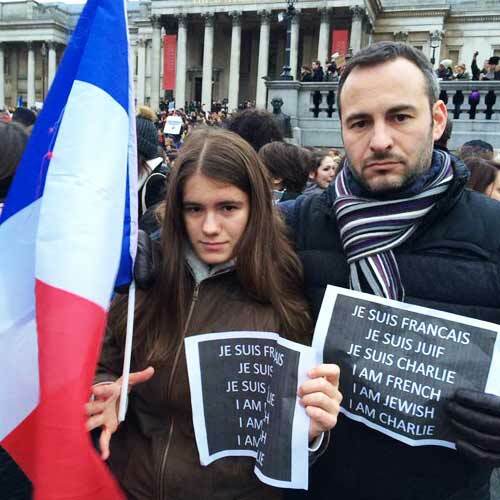 People hold up signs that say, Je suis Charlie. Will they hold up signs that say, Je suis juif? Je suis Charlie. Je suis juif. I am Charlie. I am Jewish. When the kosher supermarket was targeted a couple of days ago, someone asked me. Ok, people are ready to hold up signs saying, I AM CHARLIE. But will people march with signs that read, JE SUIS JUIF? The kosher supermarket was targeted because it was Jewish. At Charlie Hebdo, several women were spared. They were told to convert. They were not killed. One woman, however, was killed. A Jewish woman. Elsa Cayat. JE SUIS JUIF. I AM JEWISH. Just as important as I AM CHARLIE. And I'm glad to have been sent a couple of signs from ralles in France. One is of a couple both French and Jewish. 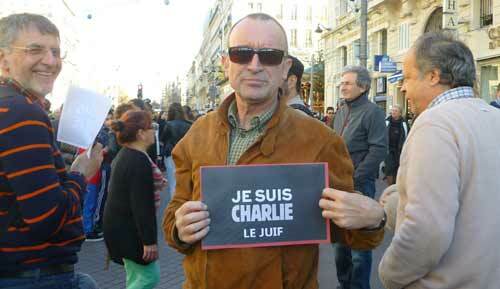 The other person: is he "Jewish" just as he is "Charlie"? I hope so. We need to stand together. We don't need to say, I am Buddhist if we are not. There is no massive prejudice against Buddhists. 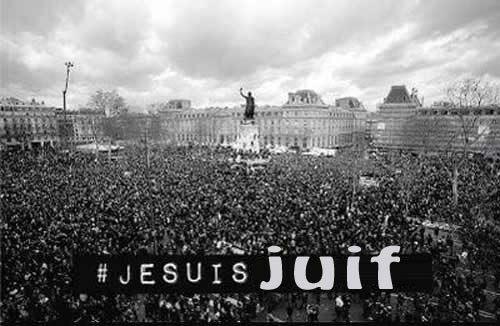 We do need to be ready to say, I am Jewish, je suis juif. As was said long ago, the freedom of no one is assured until the freedom of all is assured. That means we need to stand together to deal with all and any who threaten our freedom and safety. At least today, it seems like at least some solidarity is happening. in both English and French.